U.S. 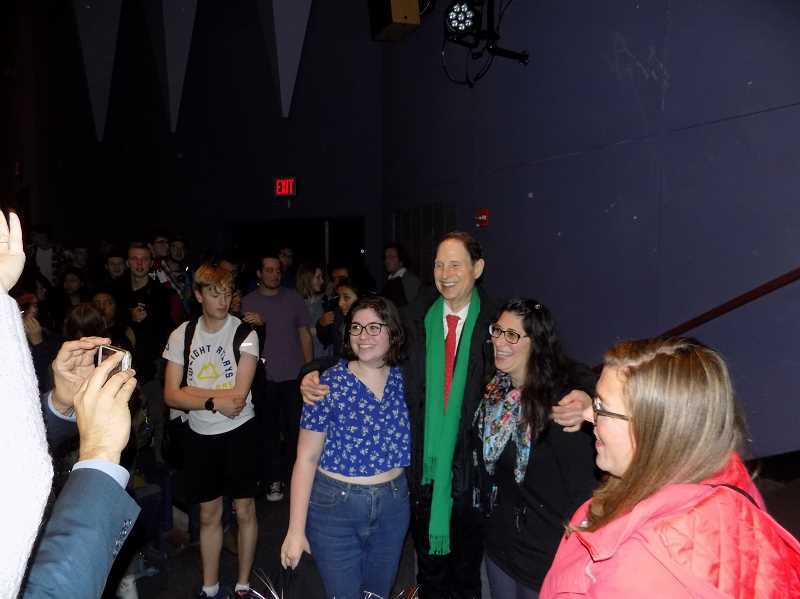 Senator Ron Wyden addressed a filled auditorium Friday at Tualatin High School responding to a myriad of questions. 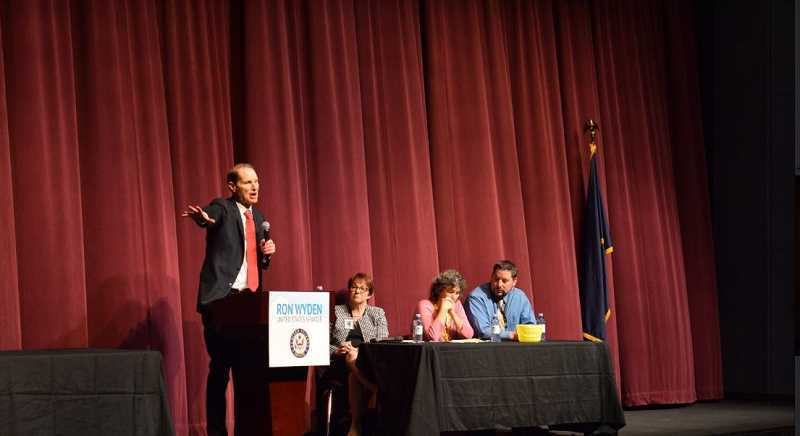 U.S. Sen. Ron Wyden spoke to a packed auditorium in the Tualatin High School auditorium Friday morning, touching on issues ranging from Medicare to the appointment of Supreme Court Justice Brett Kavanaugh as part of the senator's continuing town hall series. 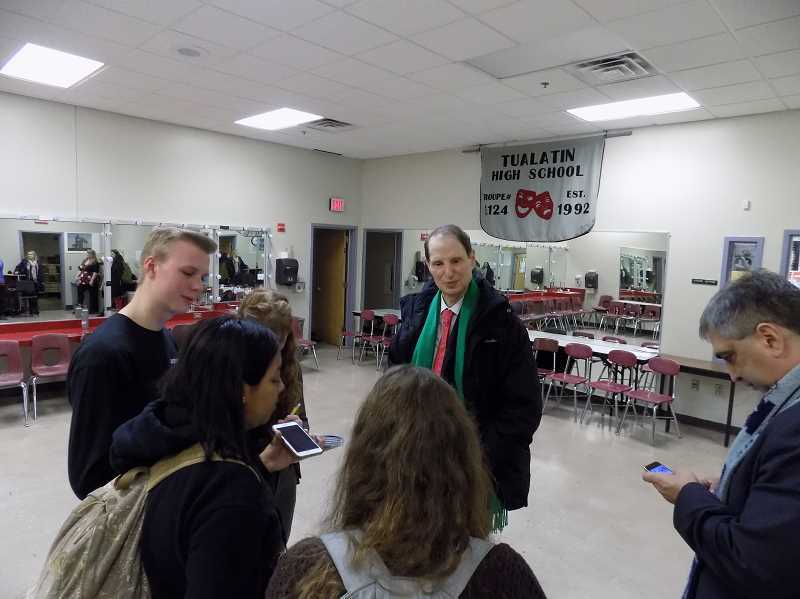 For 90 minutes, Wyden, who has served in the U.S. Senate since 1996, answered questions from the community as well as from Tualatin High School students. 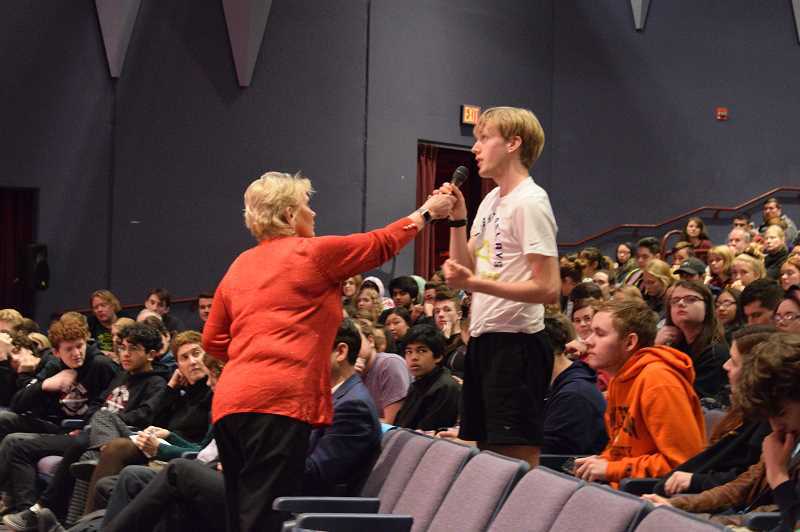 Wyden, who was marking his 911th town hall, was introduced by Tigard-Tualatin School District Superintendent Susan Rieke-Smith. "There are no subjects off limits," he told the audience before taking a myriad of questions. One came from a community member who wanted to know the senator's stance on the Green New Deal, or Congressional stimulus packages that focus on the environment and climate change. Wyden said if ever there was a wake-up call, it came after Thanksgiving when President Donald Trump's own scientists laid out a plan as to how dire climate change has become. "This is urgent business," Wyden said. He said there are currently are 40 separate tax breaks for fossil fuel providers. "I am going to propose throwing them into the trash can," the senator said, adding he is pushing for three tax breaks that would benefit the environment. Wyden also addressed questions related to Social Security and Medicare saying he has never supported privatization of social security, pointing to the financial crisis of 2008 as an example of where, if privatization was in place, "people would have lost everything." Wyden said in years past, Medicare was used to treat minor maladies such as a broken ankle, something not true today. "Today Medicare is cancer, diabetes, heart disease, strokes and chronic pulmonary disease," he said, noting that both himself and Sen. Orrin Hatch (R-Utah) have pushed for such things as telemedicine or using technology to provide clinical health care in rural communities. Vote by mail elections. Wyden said he's supportive of pushing for vote-by-mail elections nationwide. "If I have my way in 2020, every American will get a ballot in the mail and vote like we Oregonians do," he said. "The biggest opponents are the voting machine companies." Medicare for all. Wyden said he engages his colleagues daily on the issue and criticized both President Trump and some of his supporters who are pushing to not allow healthcare coverage for those with pre-existing conditions. Wyden is also opposed to short-term medical insurance, often known as "junk insurance," which are plans that provide limited coverage. "I believe health care should be a basic human right in America," he said. In addition, Wyden said he would like pharmaceutical companies to publicly reveal reasons for any rate hikes and wants Americans ages 55 to 65 to have the ability to buy into Medicare on a sliding scale. Support for the LBGTQ (lesbian, gay, bisexual, transgender, questioning, and queer) community. Wyden said in 1995 he became the first U.S. senator to come out in support of marriage equality, pointing out to applause that "if you don't like gay marriage, then don't get one." Wyden responded to his comment that he called Brett Kavanaugh "unfit" for the Supreme Court and what a student questioner said was Christine Blasey Ford lack of real evidence that Kavanaugh assaulted her years ago. Wyden said the hearings highlighted the double standard against women who are assaulted in America. "I do think survivors have gotten short shrift," he said. Wyden rejected supporting a merit-based immigration policy, saying America has a compassionate tradition of allowing immigrants into the United States. "My parents fled the Nazis in the '30s," he said. "Not all of them got out." Wyden said his father talked his way into the U.S. Army and once dropped propaganda flyers on the Nazis. The senator said his father was one of the most patriotic people he's ever met but that in his late teens and early 20s, he likely couldn't pass a "merit test." After the town hall, Wyden addressed the killing of Washington Post columnist Jamal Khashoggi, saying he (along with Sen. Jack Reed, a Rhode Island Democrat as a co-sponsor) introduced legislation to have a non-classified report made available to the public regarding the death of the Saudi journalist. Khashoggi was determined to be killed inside the Saudi Arabian consulate in Istanbul, Turkey, by Saudi government agents with the Washington Post and other news media outlets subsequently reporting that CIA officials believe that Crown Prince Mohammad bin Salman ordered his death. Wyden said he thinks there's extensive interest in what happened, noting the U.S. provides billions of dollars in aid to Saudi Arabia. "I'm also a supporter of cutting off military aid (to Saudi Arabia) because of Yemen," said Wyden. Saudi Arabia has been engaged in a war in Yemen for several years, leading to a blockade of food that might have caused the deaths from hunger of an estimated 85,000 children since that country began bombing Yemen in 2015, according to the New York Times.